Set amongst the glorious surroundings of a small country estate and a close neighbour to the magnificent Arundel Castle, the Lodge is the genuine gatekeepers home. 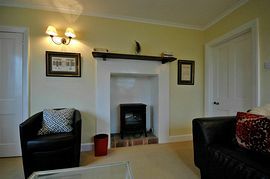 Offering two double bedrooms and a twin bedded room, it is comprehensively equipped and presented to an exceptional standard providing very comfortable and relaxing accommodation for four people. 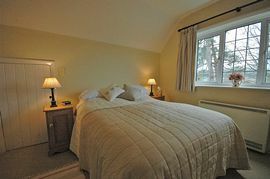 Although the Lodge will sleep six, use of the third bedroom is really better suited for families. The Lodge is one of those rare properties with a traditional layout of living room, separate dining room and a fully equipped kitchen. It has plenty of character with the traditional feature of ornamental fireplaces in every room - a throwback to life in Victorian Britain. Outside there is a large private garden, patio with a barbeque and the rarity of garaging that is made available for anyone taking a prized classic car to any of the annual Goodwood events. It is a setting to enjoy; the Lodge is in the immaculate grounds of Warningcamp House. The gardens here open four times a year as part of the National Gardens Scheme, raising valuable funds for charity. It is a beautifully presented estate that enjoys the benefit of being on the very southern slopes of the South Downs and also just 500 metres from the River Arun, providing a picturesque walk along the riverbank to Arundel. Passing immediately outside the Lodge is the Monarch�s Way, a long distance footpath en route from Shoreham by Sea to Worcester. It continues on through to Wepham and Burpham, the next door villages that are a mere mile up the road. The road into these villages stop here; go any further north and you are on the Downs, so here you will find there is no through traffic! 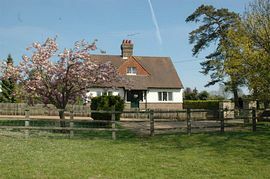 Many visitors however arrive on foot from walking on the Downs and take the opportunity of refreshment at the George and Dragon Inn a delightful pub in the heart of Burpham. 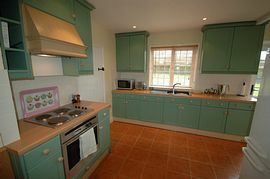 There are many attractive period properties in the village and it a delight to wander through. Opposite the pub is the Norman Church of St Mary�s and walk through the church grounds and the views quickly open out on to the Arun Valley and the South Downs. Arundel less than two miles away is a historic market town dominated by the symbolic castle that can be clearly seen from Warningcamp and the rising spire of the cathedral. It offers a plethora of craft and antique shops as well as restaurants and tearooms. It�s a great place to visit and enjoy its hospitality. Beyond the castle grounds Arundel Park extends north towards the Downs offering many fine walks. Within the park along the Gallops the John Dunlop Stables exercise their horses daily, which makes for an impressive sight. The River Arun winds its way around the town and is a magnet for wildlife. With more than 60 acres of ponds, lakes and reed beds, Arundel Wetland Trust attracts some of the world�s most spectacular ducks, geese and swans. The best way to enjoy the river is on a river cruise stopping off at the Black Rabbit pub or proceeding further north where the river hugs the scarp wooded slope at the foot of the Downs before reaching Amberley. Further afield Warningcamp is well placed for the coast. 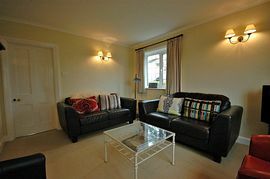 Climping Beach and Littlehampton�s West Beach are only a short drive away. This is a beautiful unspoilt length of beach of Special Scientific Interest and at the eastern end beside the mouth of the River Arun is the West Beach Café built by local craftsmen using materials sourced locally. It is worth a visit, the fish and chips come highly recommended! If you fancy a day in the city, Arundel mainline station is on a direct route to London so why not mix the cosmopolitan capital with this great place to stay!. Close to the famous Arundel Castle. Excellent road access via the A27 between Worthing and Chichester. Mainline rail service at Arundel, one mile away. Direct rail links with both Gatwick Airport and Portsmouth Harbour ferry port. Prices from: £550 to £900 per week. Weekend and midweek breaks available.